Overview: In 1956, DC introduced a brand new book that helped revolutionize the comic book industry. Following in the footsteps of The Brave and the Bold, the new comic Showcase promised to feature new characters each and every issue, based on the requests from the readers. That last part may have lasted for an issue or two before it quickly became a try-out book for new features and concepts that would become the foundation of the DC Universe. 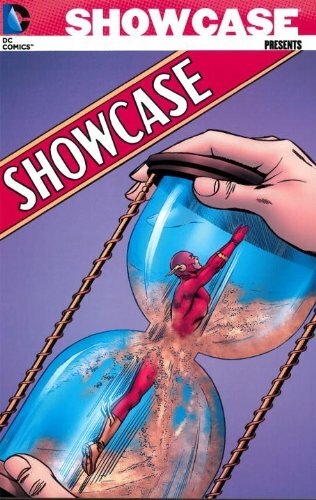 The Flash was the first big character introduced in Showcase, which was a revitalization of the Golden Age Flash concept set in (then) modern times. Barry Allen is a police scientist who was bathed in chemicals during a lightning strike that imbued him with super-speed. The Flash made four appearances in Showcase before moving into his own title, and later becoming a founding member of the Justice League. The Challengers of the Unknown are four adventurers that survive a plane crash and vow to work together now that they are living on borrowed time. The Challengers would have four appearances in Showcase before moving on to their own title. Lois Lane had been a long-time member of the Superman supporting cast, but this was the first time she was featured in her own stories. These two appearances led to her own title, Superman’s Girlfriend Lois Lane. Adam Strange is a man caught between two worlds, traveling between Earth and the far distant planet Rann. Adam Strange uses his science knowledge to help save Rann from multiple threats. After three appearances in Showcase, Adam Strange would become the lead feature in Mystery in Space. Rip Hunter has built a time bubble which allows him to travel to any era in history. With a team of loyal friends, Rip leveraged four appearances in Showcase to graduate into his own title. Why should these stories be Showcased? : This is a no-brainer. This is an absolute must read for any comic book historian, just to see the hit after hit coming out every other month in this title. Obviously, most of these issues are reprinted in other volumes, but this is a great collection to sample the early adventures of these heroes without having to buy the five other books. If you like this volume, try: reading some more stories on Space Ranger, the one main character introduced in this volume that did not earn his own Showcase Presents collection. Track down some old issues of Tales of the Unexpected. From issues #40 (August 1959) to #82 (April-May 1964), the Space Ranger was featured in this book. Following that long run, he became a secondary character that would pop-up in random comics when a DC character needed to encounter a familiar face in deep space. This entry was posted in Adam Strange, Challengers of the Unknown, DC Showcase Presents, Flash, Rip Hunter and tagged Adam Strange, Challengers of the Unknown, Flash, Lois Lane, Rip Hunter, Showcase, Space Ranger. Bookmark the permalink.